The politics of our women’s commune was limited to ‘actionism’. By changing our behavior and overstepping boundaries we tried to feel our way forward. We were bewildered and ready to try anything, which made it easier to consider the more militant solution the politically more appropriate one. The leftist movement as a whole was at sea, though. It found different ways to escape its bewilderment and a large segment of politicized female students chose this option: They joined the new Stalinist and Maoist parties: KPD/AO1, KPD/ML2, KB3, or found a home in the DKP4 — a western offshoot of the SED5. These leftists delegated the grueling search for a way forward to leadership bodies. This path demanded nothing of them but discipline and absolute devotion to any task assigned them. The precondition was training to ‘bring them into line.’ All women who joined the Socialist Women’s League (Sozialistischer Frauenbund) had first to undergo rigorous study of the Marxist classics: Karl Marx, Vladimir I. Lenin, Rosa Luxemburg and August Bebel. Since we saw no point in spending our time on analyses and solutions from the last century, we were at a loss as to what to read and where to draw fresh inspiration. Mao’s simple doctrines were fascinating, but we were not living in an agrarian society. Simone de Beauvoir6 offered subtle observations, but no suggestions for action. It took Betty Friedan7 a huge tome to say what Valerie Solanas expressed more pointedly and pithily, but her solution of doing away with men remained a gag. Readers today may find it hard to believe that although we had heard of the suffragettes and were sometimes even dismissed as “Bluestockings,” we had no memory of a German women’s movement. The Nazis had completely eradicated it. We had to rediscover the history of women’s emancipation in Germany in the eighteenth, nineteenth and twentieth centuries for ourselves. 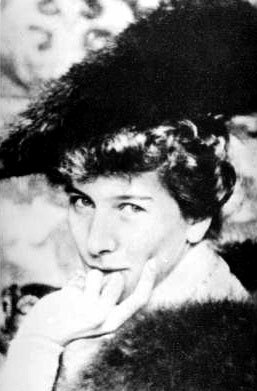 It was easier to find literature by and about Emma Goldman8, Olympe de Gouges9, Flora Tristan and George Sand than that by and about women from Germany. The Berlin Women’s Center quickly issued pirate editions of our most important finds: Bertha Eckstein-Diener’s Mütter und Amazonen (Mothers and Amazons)10 in 1974 and Mathilde Vaerting’s Frauenstaat und Männerstaat (Women’s State and Men’s State)11 in 1976. Women today might ask, “So why didn’t you just open a women’s center?” Why indeed? What took us so long is an interesting question. The student movement had mainly dedicated itself to aims arising from moral claims: Ending the Vietnam War, opposing the Notstandsgesetze (emergency laws) in Germany and the despotic rule of the Shah of Iran— all objectives that had no immediate connection with the students themselves. Even the sit-ins at university departments were not intended to help students concretely, but only to drag academic life out of the ivory tower and demand courses of study that enabled them to “serve the people.” Many of them interrupted their studies and went into the factories to educate workers. Some women of the Sozialistischer Deutscher Studentenbund (German Socialist Students’ League, SDS) were the only exception. They put their own issues in the foreground, founding nursery schools to help themselves, criticizing their men for behaving like pashas and joining forces in the Aktionsrat zur Befreiung der Frauen (Action Council for the Liberation of Women) in which they began to discuss their own problems in working groups. Unfortunately, this was short-lived—here, too, the aspiration to ‘serve the people’ gained the upper hand and women’s personal concerns were dismissed as ‘bourgeois’ and therefore ‘a luxury’. This step away from the aspiration to liberate humanity as a whole and towards a simple coming together of people with common interests —for example a women’s center—was blocked off. Even we anarchist women would never have dreamt of creating a group dedicated to our own interests. Militant activists and party members alike all obeyed a politics that was not rooted in our own interests. This alienation made it possible for us to be used without our realizing it. With the help of the various parties, individual student leaders amassed an astonishing amount of power and—as in the KBW—an empire worth millions. As we know, these parties disbanded after a few years without their work leaving any trace in society. The SED used the Sozialistische Frauenbund to gain influence in West Berlin and as a listening post. This may not have been clear at the time to the hardworking members of this or that party. But we party-resistant activists too were repeatedly used by the Berliner Verfassungsschutz (Berlin Authority for the Protection of the Constitution) and the police for their own political ends. On many occasions, these two institutions helped to ‘equip’ the activists in order to ratchet up the spiral of violence. This is how in 1971 the Berlin police finally acquired the machine guns and hand grenades they had long wanted. Those of us on the non-dogmatic left refused to rely on the Marxist classics, and we could not see how submitting to a hierarchical party leadership would further the emancipation of society. While others—such as the women of the Sozialistischer Frauenbund—saw the path clearly before them, we were still searching. Where would we find inspiration for our next step? As a film student at the dffb, Elsa Rassbach staged a conversation between Lenin and Clara Zetkin12, underlining just how old the conflict over women’s politics outside of party structures is. Whenever she showed the film to leftists they responded with sarcastic remarks. I asked myself: What was the point of accusing these hard-core leftist boys of thinking as paternalistically as Lenin? These men—who with their beards, leather coats and army boots looked like a cross between a Russian political commissar and Django from the spaghetti Westerns—had no interest whatsoever in the female view of things. There was certainly none of the consensus we find today that male chauvinist attitudes are ill-suited to enlightened men. In retrospect it is clear why only the autonomous women’s movement could bring about a change here: These women refused to indulge in dialogues of accusation and justification with men, and instead pursued their own interests independently, developing their own strengths. It was only this strength and this withdrawal that bothered men enough that they began to engage with what women wanted. One model for such self-empowerment—independent of the white, male left—was the Black Panther Party. Their program in a nutshell was to stop grumbling and putting up with things and regain your pride and dignity. The determination not to be humiliated anymore, as demonstrated by openly carrying weapons. With this policy, the Black Panther Party13 leant a new perspective to the struggle in the American ghettos starting in 1968. I was electrified by these pictures of Blacks determined not to turn their rage against themselves through drugs, gang warfare and ghetto riots, but instead to insist on their rights proudly with discipline and arms. Their members patrolled the ghettos armed and uniformed as protection against attacks by the white police. At the same time, the members educated themselves about their basic rights vis-à-vis law enforcement, so that they would offer no grounds for arrest in confrontations with the police. It was this blend of strictly legal conduct and courageous, self-assured behavior that soon made them symbols of black dignity and hope14. The Black Panthers drew some of their inspiration from The Wretched of the Earth by the psychiatrist Frantz Fanon in which, based on his experience in the Algerian war of independence, he describes the self-destructive mechanisms of oppressed people. According to Fanon, when an oppressed group is robbed of its identity and forced to take on the culture of the oppressor, the members lose their self-respect. The result is feelings of inferiority, self-hatred, unnatural submissiveness, authority complexes and sexual neuroses. Damaged in this way, members of this group direct their anger and frustration not against the oppressor, but against themselves, ultimately seeking refuge in defending their dignity against people like themselves. The parallels to women’s behavior seemed all too obvious. We women thus had the choice of hoping to find a ‘good man’ who would marry us and ensure our social mobility, or we could trust in our own power and change our living conditions ourselves and together. In order to do so, we would first need to develop a consciousness of our own, an identity independent of men, and learn to live in solidarity with other women. These insights seem banal nowadays, inextricably linked with the autonomous women’s movement. For socialist women who advocated Marxist economic theories of liberation, though, this idea was pure heresy. I devoured Bobby Seale’s book Seize the Time15, translating it word for word into our own circumstances. In fact, I saw delineated in it for the first time the basic pattern of future citizens’ initiatives: rooted in the community, ready for open resistance and eager to learn—the citizens’ initiatives were the adult education schools of the nation—and well-versed in the law. I was fascinated by the possibility of immediate and direct action and intervention. Blacks were not sitting in cadre parties waiting for the proletariat to get around to leading the revolution. Here in Germany, tens of thousands of leftists were doing just that from 1969 on. 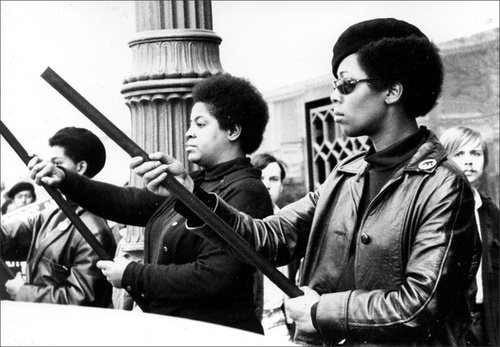 Unlike us, the Black Panthers were not an uncoordinated bunch, ‘Girl Commandos’, ‘Hash Rebels’, people without (grass)roots and responsibilities. I can still remember how thrilling this new knowledge was: Something can be done, now! Something practical and useful—not ‘the revolution’ but something on a human scale. Like Blacks we would have to examine our own thoughts and feelings, to refuse to adjust, find our own identity and learn solidarity with and devotion to our sisters. This liberated and eroticized our whole sense of life. Every rule was called into question, everything was open, everything was possible. I set aside my professional and class-based tunnel vision and discovered that the Märkisches Viertel and other bedroom communities and suburbs harbored housewives and white-collar workers who were just as curious and wildly determined as I was. The female students who had been through the ‘indoctrination’ process had already been inculcated with a viewpoint that explained everything before they even had a chance to look closely.